Sea of Glass » Strait of Georgia’s glass sponge reefs protected! “For more than six years the Canadian Parks and Wilderness Society (CPAWS) has been leading a concerted effort to convince Fisheries and Oceans Canada (DFO) to protect these reefs. They are a global treasure found nowhere else in the world. The reefs are thousands of years old and they are incredibly fragile,” said Sabine Jessen, National Oceans Program Director at CPAWS. “Glass sponge reefs were only discovered recently; they are usually found more than 100ft deep so most of the reefs are very hard to observe and study,” said Jeff Marliave, Vice President of Marine Science at Vancouver Aquarium. “But the work that scientists have been able to do shows that they are tremendously important ecosystems; they filter large amounts of bacteria from seawater and they provide habitat for a host of other species including endangered rockfish and the much-loved BC spot prawns,” adds Marliave. Fishermen targeting spot prawns drop their traps around the reefs and risk damaging the incredibly fragile glass sponges. “Spot prawns are currently considered to be a sustainable seafood choice according to the SeaChoice ranking program. These fishing closures show a commitment by DFO to address the fleet’s habitat impacts to ensure the long term sustainability of BC spot prawns and our oceans,” said Scott Wallace, Senior Research Scientist at the David Suzuki Foundation and Science Coordinator for SeaChoice. The Strait of Georgia glass sponge reefs were first discovered during seafloor mapping in 2001. There are reefs located near Galiano Island, Hornby Island, Parksville, Gabriola Island, the Sunshine Coast, West Vancouver, near the mouth of the Fraser, and in the middle of the Strait of Georgia and up into Howe Sound. “On the Sunshine Coast, local citizens have been asking for many years for protection of our glass sponge reefs, so we are looking forward to our community taking a stewardship role and working with DFO staff and fishers to ensure the long term safety of these amazing ecosystems,” said Cindy Harlow of the Sunshine Coast Conservation Association. “We have pointed out to DFO that there are more reefs in Howe Sound that were discovered after the initial proposal was made to protect these nine reefs. The Howe Sound reefs are currently at risk from prawn fishing, so it is urgent that DFO start the process to protect them too,” said Roy Mulder, President of the Marine Life Sanctuaries Society. 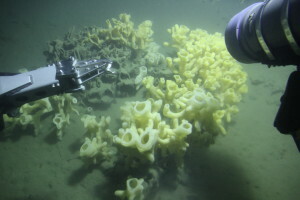 “Glass sponge reefs in BC are a globally unique treasure that we have an obligation to protect. If we destroy them, they could take hundreds of years to recover, if at all. Fishing closures are addressing one of the main threats to the reefs. However, they also need protection from other threats such as anchors, cables, and oil spills. After all, these are the only glass sponge reefs in the world!” said Alexandra Barron, Marine Conservation Coordinator at CPAWS.